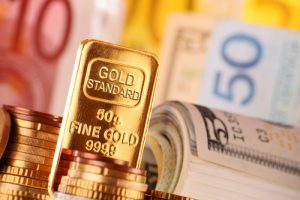 Most precious metals futures posted gains on Monday, the last trading day of 2018, and they all advanced on the month. Only palladium, however, scored an annual increase. Gold was the exception on the day, recording its first loss in five sessions as it dipped from a more than six-month high. Gold for February delivery shed $1.70, or 0.1%, to settle at $1,281.30 an ounce on the Comex division of the New York Mercantile Exchange. "We are starting to see signs of crack in the economic future of the global economy. So people are getting very concerned and are starting to put money back into gold," Reuters quoted Miguel Perez-Santalla, vice president of Heraeus Metal Management in New York. "Gold could reach the $1,400 mark this coming year," he added. Gold rallied 2% last week, ending Friday at its best price since June 14. As for December, gold futures surged 4.5% to trim their annual 2018 loss to 2.1%. In 2017, the yellow metal gained 13.7%. "Nearly 5,000 people participated in Kitco’s online polls. The results show that 1,640 participants, or 34%, see gold prices pushing above $1,500 an ounce by the end of next year. However, the bears haven’t completely disappeared as 18%, or 868 voters, see gold prices falling below $1,100 an ounce by the end of 2019. The bearish outlook garnered the second-highest number of votes in this year’s survey. Only 7% of respondents, or 329 voters, see gold prices holding around current levels, just below $1,300 an ounce." Closing higher for a fifth consecutive session, silver for March delivery rose 10.4 cents, or 0.7%, to $15.54 an ounce. The settlement was the highest since the precious metal ended at $15.559 an ounce on July 31. Silver futures soared 9.3% in December but they still dropped 9.4% on the year. They advanced 7.2% last year. April platinum added $4.20, or 0.5%, to $800.60 an ounce, for a 0.1% gain in December. Palladium for March delivery rose $13.80, or 1.2%, to $1,197.20 an ounce, boosting its monthly increase to 4.6%. On Dec. 19, palladium ended at a record of $1,20.30 an ounce. The pair split on the year with platinum falling 14.7% and palladium rising 12.8%. Gold rose $2.65, or 0.2%, to $1,281.65 an ounce. Silver added 17 cents, or 1.1%, to $15.465 an ounce. Platinum rose $6, or 0.8%, to $794. Palladium declined $7, or 0.6%, to $1,263 an ounce. For December, advances included 5.3% for gold, 8.6% for silver, and 4.8% for palladium. Platinum, however, declined 1.4%. In LBMA annual results, gold lost 1.2%, silver fell 8.3%, and platinum declined 14.4%. Palladium surged 19.6%. American Eagle silver coins reached 15.7 million ounces for their lowest sales year since 2007. The annual retreat marks a second in a row. Silver Eagles sales hit nearly 18.1 million ounces in 2017, came in above 37.7 million ounces in 2016, and scored an annual record of 47 million ounces in 2015. The 1 oz. silver coins have been produced annually since 1986. American Eagle gold coins tallied to 245,500 ounces — also marking a second straight annual slowdown and the weakest total since 2007. Also introduced in 1986, the U.S. Mint strikes American Gold Eagles in four formats — 1 oz. coin; 1/2 oz. coin; 1/4 oz. coin; and 1/10 oz. coin. American Buffalo gold coins logged 2015 sales of 121,500 ounces, rebounding from 2017 when they registered sales of 99,500 ounces for their smallest annual total ever. Their two highest years were in 2013 at 239,000 ounces and their debut year in 2006 at 323,000 ounces. The 1 oz. series was introduced in 2006. 2018-dated America the Beautiful 5 oz. silver bullion sales totaled 222,500 coins for the highest amount since the 2016-dated issues reached 330,000 coins. Last year’s releases combined for 150,000 coins. American Eagle platinum coins totaled 30,000 ounces following two straight years at 20,000 ounces. The series was introduced in 1997 as an annual product for investors but has not always been issued. Most recently, it was absent from the U.S. Mint’s product lineup in 2015. The U.S. Mint has not always produced the coins to meet demand, as has been the case since 2016.